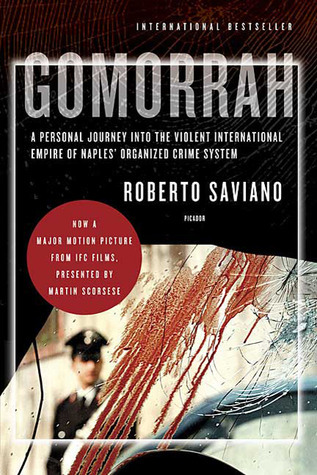 Roberto Saviano’s Gomorrah has been on my own-but-haven’t-read-yet shelf for a while now, and with the death of Henry Hill (the subject of Nicholas Pileggi’s Wise Guy) this summer, Gomorrah caught my eye again. I saw the film not long after it came out in 2008 or 2009, but found it choppy and difficult to follow. Fortunately the book (as is usually the case) is much better… although I might give the movie another try now. This is the first book I’ve read on Italian organized crime, and the most current. Half exposé and half narrative, Saviano tells his personal account of how organized crime has influenced and infiltrated every aspect of life in Italy, with most of his focus on the Camorra in the southern Campania region and its capital, Naples. Much of the writing is quite dry and stoic, which could be a symptom of the translation, but much of the time it works. Saviano is a journalist, reporting on brutal and seemingly endless clan wars. The descriptions of cold-blooded torture and killings, literal burning wastelands, and the cycle of destroying lives and families are chilling. There were several moments in the book where I was truly moved by his emotional outrage and philosophical observations about his homeland and it’s current societal climate. It took a little while for Gomorrah to really grab me—the opening chapters are full of lists of names and places that were a challenge to keep straight in my mind. But once he delved into the Secondigliano War, I was hooked. His chapters on weapons and drugs dealings, women and their roles in the clans, the courageous priest Don Peppino Diana, and the toxic ravaging of the environment were especially absorbing for me. That the youth of southern Italy are hopelessly destined to join clans, even girls (by marriage or offspring), is heartbreaking. I was left stunned after finishing Gomorrah. Once you settle into the writing style, you clearly see the turbulent, austere portrait Saviano has painted. After the book’s publication, Saviano was placed under constant police protection. Gomorrah is an intense, powerful, and eye-opening read. Read from June 27 to July 23, 2012. This entry was posted in books and tagged memoir, non-fiction, organized crime by kristin @ my little heart melodies. Bookmark the permalink.